Heavy weight wedding or anniversary ring, the body is of sterling silver with 14K gold rims, also available in all gold, see the options below. 9-10mm wide. 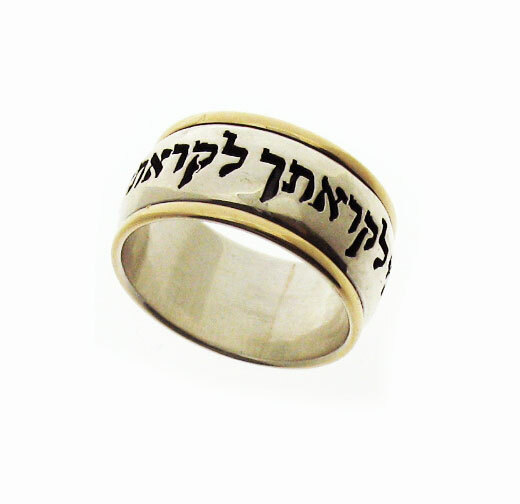 Each ring is made to order by a prominent artist in Jerusalem. 1. "Ani Ledodi Vedodi Li" (I am to my beloved and my beloved is mine). 3. "Ha'ahava Hi Mekor Hachaim" (The love is the source of life). 4. "Matzati Et She'ahava Nafshi" (I found him, whom my soul loves). 5. "Ba'asher Telchi Elech" (Where you will go, I shall go). 7. "Simeni Kahotam Al Libcha" (Put Me Like a SEAL Over Your Heart). 8. "Tihye Nafshi Kshura Benafshech" (Let Our Souls and Spirits Interwine). 9. "Betseti Likatcha Likrati Metsaticha" (when i go forth to find you - i find you seeking me). Please allow 2-3 extra weeks for delivery. Rush order? please contact us.